Who wants to deal with an arduous New York City commute when you can have your workspace and live in it too? 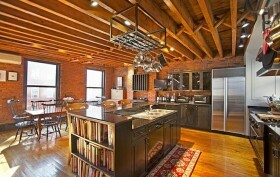 Well, there’s a beautiful red brick townhouse in the heart of Tribeca offering just that, for $20,000 per month. The 25-foot wide townhouse at 155 Duane Street was initially built in 1830 and restored in the 1990s. It features a fully equipped storefront office space with seven workstations, and a four-floor residence above. Now the entire one-of-a-kind building is available for 12-18 months, for the first time ever.